Brian May has said a long-forgotten Queen track is "crying out to be... brought into the world". 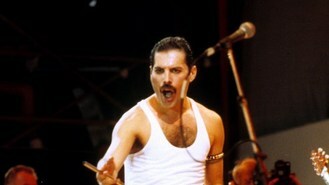 The Sun reported that the song, featuring the late Freddie Mercury on vocals, was penned more than 30 years ago. Brian wrote on his blog: "Some Queen magic is happening... I feel it in my bones. "It's annoying to have to be secretive, but I guess I have to, for now. "The track we dusted off today has the four of us - Freddie, John (Deacon), Roger (Taylor) and myself - playing together on a track we'd all forgotten about that was never finished." The guitarist added: "It sounds so fresh...I got quite emotional hearing some of it. Some rough takes, some discussion and banter, and then a really good take... It's crying out to be finally brought into the world." "What's great is that nobody has got hold of this and leaked it... I can't help but feel a buzz." Little Mix have revealed they were stunned after reciving support from the Spice Girls. Duncan James has dismissed claims that he enjoyed a gay fling with Blue bandmate Lee Ryan. Take That have hinted that they have started work on their next album. One Direction heart-throb Liam Payne has apologised after a photograph emerged of him standing on the ledge of a high-rise building. Arctic Monkeys lead the field for this year's NME Awards with eight nominations. Marvin Gaye's family have reached a settlement with Sony/ATV over their claims that there is a copyright infringement on Robin Thicke's track Blurred Lines. Mick Fleetwood has confirmed that former bandmate Christine McVie will be returning to the group on a permanent basis. Britpop could be making a comeback if Blur bassist Alex James gets his way - he has applied to trademark a drink of the same name. OutKast have announced that they will be playing more than 40 festival dates in 2014 as part of their 20th anniversary comeback.